AM Burns talks about the many different winter holidays. Tabatha Heart talks about the excitement of the season, and being grateful. There are lots of prizes to be won along the way. Today is the day you can enter to win our grand prize, but we’ll get to that in a bit. For our final Colorado Christmas post, we’re sharing our answers to a very short interview. Enjoy! Caitlin: It’s not really a holiday movie but I especially like watching Monty Python’s Holy Grail right about this time of year. The past few holiday seasons have been hard on myself and my family and watching that movie with its goofy humor and fake horses makes me smile when very few other things do. I also watch the British version of Death at a Funeral in late December as well. Both have morbid humor in them but that’s the best kind to get me to laugh like crazy and completely forget about everything else that is going on. At least for a little while. Cari Z: A Muppet Christmas Carol, because muppets make everything merrier. PD Singer: I adore The Santa Clause movies with Tim Allen: the delightfully skewed internal logic makes me happy. Caitlin: Trans-Siberian Orchestra’s “Christmas Eve/Sarajevo 12/24,” and recently I’ve been listening to Pentatonix’s “Little Drummer Boy” and “Carol of the Bells” a lot. Cari Z: “Carol of the Bells,” because it’s just gorgeous. PD Singer: “Jesu, Joy of Man’s Desiring” (Bach) is my favorite, because it has no words and I love playing it on my violin. ML Rhodes: …again, can’t just pick one. I love Christmas music!! “Aspenglow” and “Christmas For Cowboys” by John Denver, “Carol of the Bells” (pretty much any version), “Wizards in Winter” by Trans-Siberian Orchestra, “Santa Baby” (the Eartha Kitt version), “White Christmas” (Bing Crosby version), “O Holy Night” (most versions). Marie: This one is tough. I love some of the other music mentioned, especially “Santa Baby,” and TSO’s insanely fantastic album, Christmas Eve and Other Stories (I could sing the entire album for you, but only a tone-deaf person could stand to listen). But I think my favorite holiday song is Nat King Cole’s “Christmas Song” (which most folks refer to as Chestnuts Roasting on an Open Fire). I love the way he captures the quiet holiday comforts adults cherish and the bright-eyed anticipation of children all in one short song. Carter: The only one I can stand is “All I Want For Christmas” by Mariah Carey. And only her version. I work retail. All the others have been overplayed. What did you ask Santa to bring you? Caitlin: An ice cream maker so that I can have my chocolate/peanut butter needs met without having to leave the house or put on real clothes. Cari Z: I want to see reindeer. Regular deer just aren’t as filled with the holiday spirit, so bring me some Prancer and Dancer to ooh and ahh over, please. PD Singer: Santa has requests for earrings this year. ML Rhodes: I asked Santa for… The Broncos to win the Super Bowl. World Peace. A white Christmas. Juicy Pear Jelly Bellys. And most of all…more writing time in 2014!! Marie: I asked Santa for a new hot water heater. He said no. But I’d be happy with that Superbowl win ML mentioned! Tabatha: An all inclusive trip to Halloween Town, I really want to meet Jack and Sally! So now it’s your turn! Answer our interview questions in the comment section below, and you’ll be entered into a drawing for a $50 gift card (winner’s choice of ARe or Amazon). We’ll announce the winner on Christmas Eve. Whatever holiday you celebrate, the Out in Colorado crew wishes you an abundance of peace, joy, and laughter. My favorite Christmas movie is a tie between White Christmas and National Lampoon’s Christmas Vacation. I only want one thing for Christmas this year. I want Eric Arvin to get better so he can go home with Tj where he belongs. Muppet Christmas Carol … I had never heard anyone else use 1 more sleep till Christmas until I watched this film. My parents had done it for years! Merry Christmas everyone by Slade … I remember it being released as a child and it’s just not Christmas until I heard that song! I asked him to bring me a new kindle coz mine is about ready to give up .. I have to charge it every other day it has been used so much … and it’s only 2 years old!! My favorite holiday song is: “I Believe in Father Christmas” by Greg Lake I’ve been singing this song for ages it’s been my favorite song for years and I’ve just found out what it’s called from R J Scott. I asked Santa to bring me: Money for books of course!!! My favorite holiday movie is Love Actually. I love Christmas music so it’s difficult to pick just one favorite song – maybe Have Yourself a Merry Little Christmas or Santa Baby or Christmas Wrapping. I love listening to The Nutcracker this time of year too. I asked Santa to bring me books and gift cards to buy books! Happy Holidays! My favorites are Holiday Inn and White Christmas. Favorite songs would include Snoopy’s Christmas, The Christmas Song (Chestnuts Roasting) and White Christmas. Happy holidays to one and all. My favourite holiday movie is Miracle on 34th Street. I love Mahalia Jackson’s Christmas songs and her version of O Holy Night is a personal favourite. I’ve asked Santa to bring good health and happiness to my family and friends. Sappy I know but I really love them all. Fave movie: A Christmas Story – we even went to visit the house when I went to Cleveland. Gift from Santa: Well Friday I got my gift of a new job starting next summer so I’m pretty happy with that, but …. um, diamond earrings if I’m going to shoot big? My favorite Holiday movie is While You Were Sleeping. I love so many Christmas carols and songs, that I can’t really choose. One of my favorites is Angels We Have Heard On High. I’ve asked Santa for a Kindle Fire, although my Kindle Touch is still in great shape. My favorite holiday movie is Love Actually. Favorite holiday song would probably be “Chestnuts Roasting on an Open Fire” because I change all the words to make them funny. Truthfully, I’m not very fond of holiday music. And, I asked Santa to bring me a kitten. My favorite Christmas movie is probably Love Actually. My favorite song is Jill Sobule’s version of Merry Christmas From the Family. Favourite Christmas Movie,,,, The Muppets Christmas Carol, I’ve always loved the muppets and as a child wanted to marry Kermit. Favourite Christmas Song,,,,, Fairy Tale Of New York by The Pogues And Kirsty Mccoll. What I asked Santa for,,,,, For my family to continue to be healthy and happy, we’ve had a hard year with Cancer affecting a Antie and a Uncle. My favorite holiday movie is between the Muppets Christmas Carol and Silent Night. My favorite Christmas Carol is Carol of the Bells. And I asked Santa for a new job and warm slippers. Peace on Earth and Goodwill toward all men isn’t a bad thing either. Favourite movie. Toss up between Going My Way and A Christmas Carol. Favourite song. I’m like Carter and have worked too many years in retail. I can’t stand most of the Christmas music but I do like songs by Bing Crosby. Gift from Santa? I don’t really need or want anything so Good Health and Happiness to all especially Eric and Tj. I know it’s a cliche, but I do like “It’s a Wonderful Life” as my favorite holiday movie. I’ll agree with some of the authors’ choices above and choose TSO and Nat King Cole, almost any of their Christmas songs. As a freelancer, I’ve asked Santa for more work in 2014. I have no idea what my favourite holiday movie would be, I very rarely watch movies. My all time favourite is Brief Encounter. Gift from Santa, well much as I’d love a winning lottery ticket I do have all that I need, so to join in with so many other people I am hoping for Eric to have his surgery successfully and make a rapid recovery. I think my favorite Christmas movie would have to be Santa Claus is Coming to Town! Favorite song is Carol of the Bells. I am that person in your family you hate, I didn’t ask for anything for Christmas! I would love to ask for GCs to my favorite online book stores, but better my conservative family not wonder why I need book money & what kind of books I’m reading! We have some great answers so far! Thanks so much to everybody who’s stopped by. We’ll draw a winner on Christmas Eve, so there’s still plenty of time to enter. Favorite Christmas Song: Anything by Bing Crosby but I especially love his version of Jingle Bells with the Andrews sisters. 🎅 request: Nothing! Although that Broncos Super Bowl win would be pretty awesome! 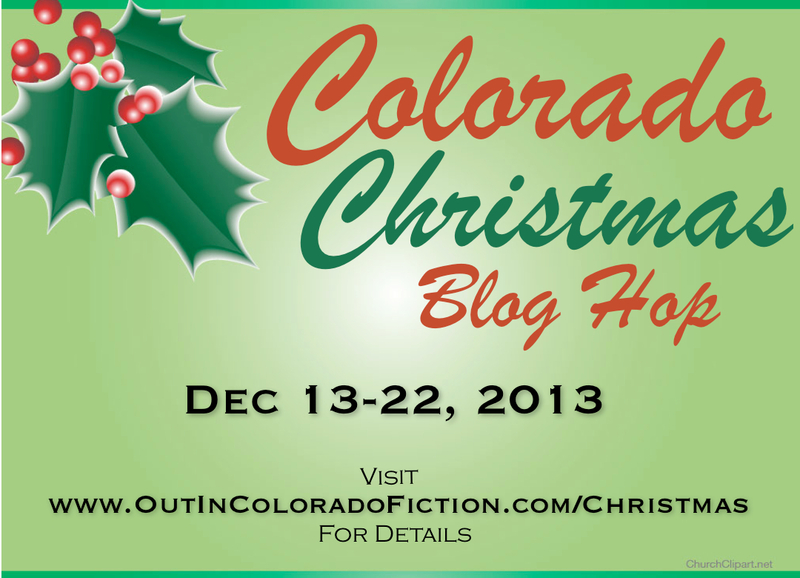 I enjoyed reading all the Out in Colorado blog stops! Colorado Strong! Favorite movie had to be Nightmare before Christmas because Jack is so lovely that all he wants to do is being Christmas to all the children even though he doesn’t quite get it right. Favorite song has to be Mary’s Boy Child as this takes me back to my childhood.